Mobile is all about getting super fast access to what you’re looking for and Google Voice is no exception. So, today we’re releasing an update to the Android app, which gives you immediate access to your Google Voice Inbox and settings via two new home screen widgets. The Settings widget gives you quick access to four handy features. Get instant access to the full Google Voice app by clicking the Google Voice icon. Quickly compose and send free text messages. Change what calls to place via Google Voice on the fly. You can have your phone use Google Voice for all calls, or just some of them. Select Do Not Disturb and all calls to your Google number will be sent straight to Voicemail. Plus, your credit balance is displayed so you know when it’s time to add a quarter or two. The widgets can be used together or individually, and are part of the new Google Voice app, available for download from Android Market today. To add the widgets to a home screen panel, press the menu button from the home screen and select “Add>Widgets>Google Voice Inbox or Google Voice Settings”. You will need a valid Google Voice account to use them, and Google Voice is available free to anyone in the US. @Rob - You can stretch the widget using resizeable widgets in LauncherPro or ADWLauncher. I prefer LP, but both are great replacements for the stock launcher. I use LauncherPro currently but often switch between it and ADW, until I am decided I do not want to pay for LauncherPro, and it cannot resize for free. Also, resizing simply stretches it, I would rather keep the message portion the same and use the extra space to increase arrow size, similar in size to the native facebook and twitter widgets. It would be nice not to have to have all 4 buttons on the widget. Personally, I will only ever use 2 or 3 of them. I make _ALL_ my calls with Google Voice, so I will never de-activate that feature and its an annoying button that just gets in the way. Can the widget be customized to allow this? Or... even better... can all 4 of the buttons be individual icons we can put on our home screen? Great addition. I just wish that we could port current cell numbers into google voice instead of using a separate google number. I use the Voicemail feature the most, but would use the other features if it had this ability. I just don't want to give people another number to remember me by. I love GV, but I wish I could set within the contacts which people I want to call using GV number or not. It would be awesome to set it to call certain people with GV, and not others. That way I can always "look" like my GV is my number to certain people (like work contacts). Alas, I've tried so many widgets and end up getting rid of almost all. This one is no exception. The button that changes which calls will be handled by Google Voice makes it WAY too easy to change this and I never need to, so it will just cause problems. The widget displaying recent message might be better. 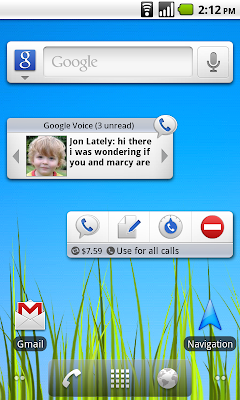 Not just to complain, the regular Google Voice interface is awesome, so a widget is not so beneficial. Widget's not showing up in the list of widget's to add... what's the problem? The "Do Not Disturb" button in the widget is not working for me. If I press it I get "Turning on do not disturb", but then it immediately goes back to "do not disturb off" (it doesn't become red like in the blog sample image). - Soft reset (power button + lower volume + trackball). - Power off the phone. - Uninstall and reinstall the GV update. "I love GV, but I wish I could set within the contacts which people I want to call using GV number or not. It would be awesome to set it to call certain people with GV, and not others. That way I can always "look" like my GV is my number to certain people (like work contacts)." I totally agree. That way one could choose not to use GV to call people who use the same mobile carrier (without having to choose manually for each call), so that air minutes for those calls would not be counted. I agree with wanting the ability to have the widget 4x1 and to stretch in landscape - and I am happy with the stock launcher on my Droid2. Absolutely love the widget, though! Ever since the update, my HTC Aria is painfully slow when using GV. Everything else is fine. Help! +1 Mal. So slow. Everyone I've talked to has the same issue. +1 Mal. Google Voice is really slow now. After the update, Voice for Android is slow!! It's decreasing my productivity. Motorola Devour : recent update required my phone to be restored to factory settings and programming. IT froze my phone, made buttons stop functioning, slowed the phone, etc etc, FIX PLEASE.